These recipes are for educational purposes only. We do not take responsibility if you make these recipes wrong and become sick! Do your homework and research making your own alcohol, it can be very dangerous and even deadly! 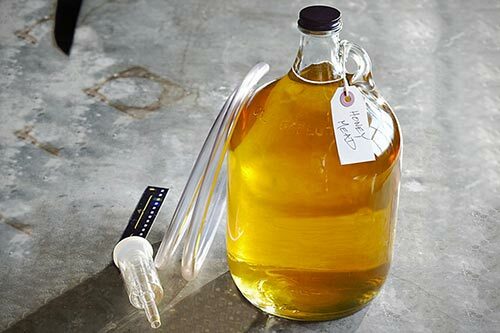 In your primary fermenter add your honey to 1/2 gallon of warm water with your acid and tannin added. Stir until your honey is dissolved. Add remaining water and ingredients except for your yeast. Cover your fermenter and wait until your S.G. reaches 1.040. This will take a week or so. Rack your wine off of the sediment (syphon into your secondary fermenter) and attach your airlock. When your S.G. has reached 1.000 then your fermenting is done. This will take about a month or so. Rack your wine again, reattach your airlock and let it set for another month or 2. Keep reracking your mead until it is clear. Usually 3 rackings is good. Now… go ahead and bottle… You will want to let your mead age for at least 1 year… 2 is better and 3 is best. Check out another 100 year old unusual but delicious mead recipe on the next page.